How can you use what you’ve gleaned from the Fascia and Yoga Series to enliven and optimize your posture and live more happily in your body? Turn your yoga or movement practice into bodywork: fascia-fy your practice (bad joke but oh so hard to resist). 1) We become the shapes we make most often. Choose and emphasize poses that counterbalance your lifestyle. What are your postural weaknesses and strengths? Approach life in your body like you approach your practice, with constant curiosity and self- inquiry. If you work with a computer, sit in a chair all day or look at your phone often (yes- I mean you), yoga can help counter balance that foreword collapsed slouching tendency that wrecks havoc on our spine. In our modern world, a therapeutic practice means strengthening the back, opening the front body, especially the hips, the chest and the organs (also- the abs, sorry crunch-addicts, doing to much ab work often creates a severe imbalance between the front and back body). 2) Cultivate a democratic body community. Engage your whole body in each pose to nourish, hydrate and irrigate your fascia. Every pose starts at the fingers and toes and engages into the depths of the organs. From the depths of the core, each poses emanates out organically, creating lift and extension through the spine and the limbs and expanding your awareness. In asana, we aren’t shooting for the limits of flexibility or strength; in fact, we are shooting for the balance between the two. Balance is strength. Balance in the tissues translates to balance in our emotional experience because of the relationship between the fascia and the nervous system. 3) Slow down and Interocept: Feel the intricacies of what's happening inside of your body. Shift away from poses as performance, letting go of an emphasis on external form and refocusing on the internal experience. Place your hands on your body as much as possible and bring your attention to the sensations underneath them. Notice the calming effect of touch on your nervous system. While contemporary yoga asana has mastered the process of encouraging proprioceptive awareness in students, it's emphasis on the external form of physical postures may forecloses deep mindfulness of the subtle body and the inner body, a form of consciousness called introspective awareness. Fascia has 7-10x's the sensory neurons as muscle, making it one of the most direct links to our nervous system. The more we stimulate the fascia directly through touch and movement, the we build our body map, encouraging a clear flow of information and fluids from the brain to the tissues. 4) Focus on the "hot spots for mindfulness": The places which most frequently harbor unconscious tension preventing us form being present to our embodied experience include the jaw, the occipital ridge where the spine meets the skull and the tongue. Opening your practice with a self-massage of the head and neck and keeping these spaces soft during your practice will, in turn, release tension in other areas of the body. 5) Practice for less time, more often: When re-training the body to hold itself in a more balanced way, the more often you gently remind your body of new habits, the more effective your brain is at sealing in the information. It's not the duration but the frequency of practice that makes the biggest difference in improved well-being. A ten minute practice every day is immensely more beneficial than one 90 minute class a week. Three mindful five minute classes has an even higher payoff. Coming back to the breath in the face of stress multiple times/day has the highest postural pay-off of all. 6) Keep the breath stable, with a preference for the exhale. The nervous system remains relaxed and adapts best to postural changes over time with the support of calm, even breathing. Generally, we are all more stressed than our postural health can support. Labored breathing places undue strain on almost all of the muscle of the torso. Give yourself a break and sink into the exhale. 7) Constantly vary your practice: Performing the same movements again and again over years (cough.. Bikram.. ahem) sets you up for repetitive stress injuries. The more unique and varied shapes you can make with your body in your daily life, the more irrigated and juicy your fascia will be. 8) Roll around on tennis balls: Body rolling is an incredibly powerful way to awaken, strengthen, juice up and love up your fascia while increasing flexibility, muscle tone and overall happiness. Fascia has 7-10x's the sensory neurons as muscle, making it the most direct links to our nervous system beyond the visual system. Enter foam rollers, body balls and yin yoga. 9) Relax. The journey is the destination: This process of deepening your level of intimacy with your body is a practice of svadhyaya (self study) that is incredibly empowering and is it's own reward. Even the willingness to engage in a process of postural exploration will bring potentially profound benefits to your nervous system and bodily health (see Interoception: The Future of Asana). Release attachment to making certain shapes with the body perfectly by practicing radical self-acceptance. Reframe each pose as an opportunity to stimulate your organs and your fascia. Our yoga practice is just a playground to explore our relationship to our bodies, to gravity and to our deeper purpose. 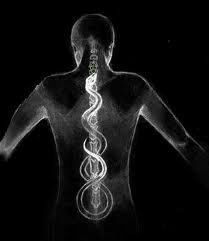 The lengthening of the spine is critical to optimizing the fascial channels of communication through the body and opening the nadis (energetic pathways), allowing infinite potential (kundalini) to rise from the tip of the tailbone to the apex of the brain.